Lennard 2018 football seniors gather for last game on sidelines with Coach Matt Kitchie at far right. Players from left: Travis Manning, Michael Rigolizzo, Jeremiah Weston, Hayden Hensley, Laudrey McCray, Quatrell Carter, Xavier Mitchell, Braden Nash, Travis Jemeson, Abdul Johnson, Jahtavis Philpart, Trajan Moss, Darian Graaham,Cody Gibson, Corey Freeman, Delvin Lawson. Lennard’s Tino Hunt, #21, carries the mail and delivers for the Longhorns one more time against Hillsborough. For the season, Hunt ends the season behind good blocking with 1,607 yards on 233 rushes and 16 TDs. RUSKIN — Coach Matt Kitchie’s Lennard Longhorns took the short opening kickoff with good field position in a light, off-and-on rain drizzle on Senior Night for the last time this season under the Friday Lights. The orange-clad Longhorns immediately launched a time-consuming drive on the ground, clearly dominating Hillsborough’s defense. Then with about 6:30 left in the first quarter driving toward first blood from the Terriers’ 20, the slick pigskin fell to the soggy turf for the taking on the Terriers 20. Misfortune struck. The Longhorns’ season in a microcosm! On the botched handoff, Hillsborough was presented a la carte an easy “scoop and score” for 75 yards. Hillsborough went for two early, and converted to jump out front 8-0. One more touchdown and two-point conversion and Coach Earl Garcia’s team went up 16-0 at halftime. The Longhorns continued to bring it, with a score and PAT in the third quarter. Both teams added a TD without a conversion in the fourth to put the final tally at 22-13. 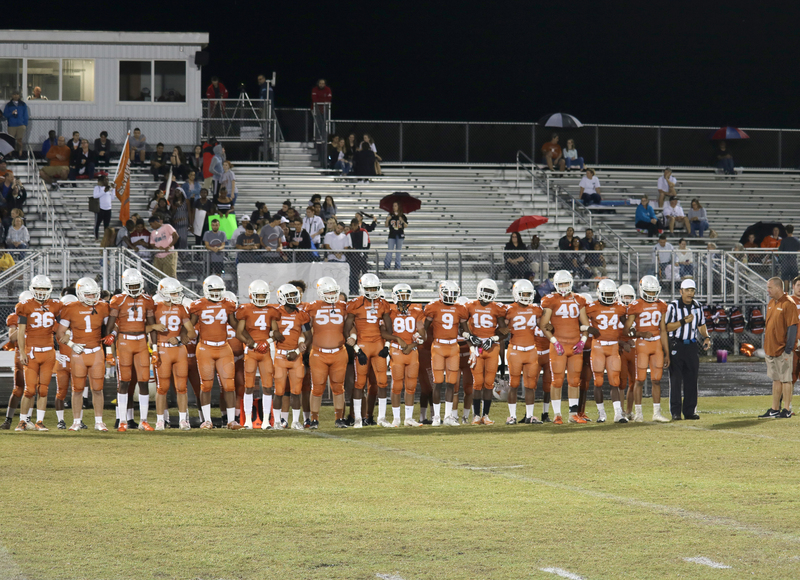 But it was too little, too late for Lennard, which slipped to 2-8 on its concluded season. 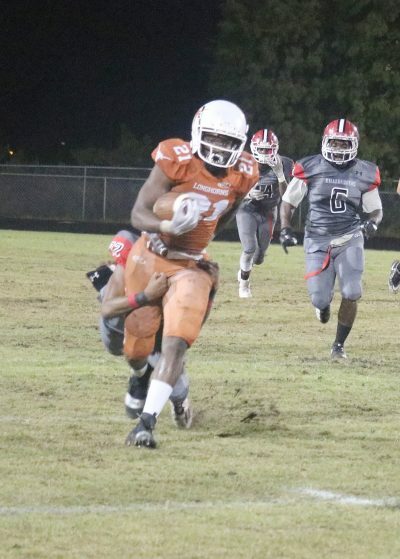 Lennard finished 1-5 in the highly competitive 7A District 9, a rung above Strawberry Crest in the cellar. Hillsborough’s worksheet reads 5-5, 3-2 in 6A District 7 where Armwood and Chamberlain continue in the playoffs. The Longhorns, behind a stout offensive line and the running of Tino Hunt and Mike Rigolizzo, compiled some decent stats against Hillsborough but could never get over that one early mishap. The good news is that, except for fullback Rigolizzo, the offensive line and Hunt will all be back in orange next season. Jeremiah Weston, #11, was one of the Longhorns’ seniors honored in pre-game festivities prior to the last game of the season with Hillsborough High under intermittent light rainfall last Friday in Ruskin. 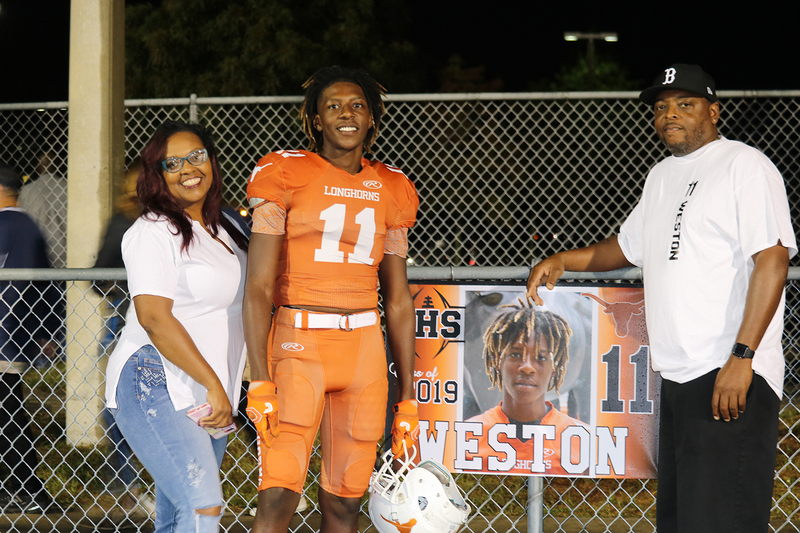 Weston is shown with his parents Crystal and Gregory Weston. In the Hillsborough loss, once again Hunt was the primary offensive weapon, toting the ball 23 times for 133 yards and the two Lennard touchdowns. Rigolizzo carried 10 times for 67 yards, senior quarterback Hayden Hensley wound up with five runs for 24 yards, and senior Corey Freeman tacked on 3 yards on 3 rushing tries and added 57 yards on 3 kickoff returns. Hensley hit on 3 of 11 passes for 29 yards and one interception. Dax Corr had one catch for 14 yards, Jacob Martinez reeled in a pass for 10 yards, and Hunt picked up 5 yards on a pass reception. Senior Jahtavis Philpart, playing for the last time in orange at safety, also returned a punt for 7 yards and a kick-off return for 21 yards. Junior DeAngleo Pallares made his only PAT attempt. Shouldering the defensive load for the Longhorns were juniors Kourtland Mitchell and Davian Papius along with seniors Jeremiah Weston and Delvin Lawson among others. Post-season honors have been accorded to two of coach Kitchie’s Longhorns. Both senior center Hayden Gondeman-Matthews and junior offensive lineman Michael Rankins were selected to the first team offense by the District 15 coaches of the Florida Athletics Coaches Association. 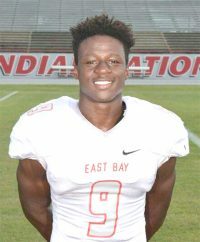 GIBSONTON — The East Bay Indians’ season ended last Friday on an unusual note, although they chalked up two more victories in the win column to go 8-4 overall and 2-4 in 7A District 9. Coach Frank LaRosa’s team might have made the Ripley’s Believe It Or Not by winning a road game and a home game on the same night and posting the doubleheader win. The East Bay squad registered the 2-0 win without even getting on the bus for Tampa. Blake, 3-8 and 1-5, in 6A District 7, was forced to forfeit the game to the Indians due to a bench-clearing brawl in their Oct. 25 game with King, which led to suspensions of both squads. In district play, the Indians finished in fifth place with powerhouse Plant City, Bloomingdale and Tampa Bay Tech all making the playoffs to extend their season this Friday. On the field of play at home Friday, Nov. 2, the Indians also beat Alonso 42-0 in a hastily scheduled game as Alonso, too, was left without a “real” game (and a win by forfeit) due to King not being able to play them as scheduled. The 8A District 6 Ravens from Tampa finished 2-4 and 5-6 overall. Indian highlights were aplenty in the decisive victory over Alonso. And leading the charge on both sides of the ball as usual were EB seniors Joaquin Isidro and Tre Everett. Isidro rushed for 125 yards and a trio of touchdowns. The two-way threat eclipsed the 1,000 yard rushing mark, totaling 1,034 on the year. Isidro, who also plays a tough defense, is the first East Bay runner going over 1,000 since Chaz Burrows accomplished that feat in 2008. For good measure, Isidro added a pick six with an interception. Not to be outdone, Everett contributed 106 rushing yards on offense. Defensively, the busy Everett added a scoop and score on a 19 yard TD, and picked off an Alonso wayward aerial. Senior running back Zaron Wright also went out in style, chipping in with 15 yards rushing. Helping the Indians achieve a shutout was two-way stalwart senior Jayden Oliver with an interception. In the team effort, other defense stoppers included two-way sophomore Ethan Lyons with 4 tackles for a loss and 2 sacks on the evening. Lyons pushed his season sack total to 9, tops in the district. His two-way defensive buddy, junior Jaden Lopez, picked up 3 tackles and 1.5 tackles for a loss. 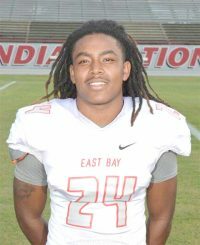 Individual season honors have already been meted out to two East Bay seniors: Jontrell Oliver and Tre Everett, both named on District 15 All Defense team. For Indian season stats, junior quarterback Cam Peternell settled in to lead the way with 12 of 27 passing attempts for 162 yards in a predominantly rushing attack. Peternell also added 195 yards on the ground and two TDs in 22 carries. 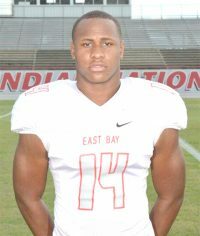 East Bay is losing its leading rusher, senior Isidro, who ran the ball 171 times for 1,034 yards and 2 TDs. Also graduating is the other half of the dynamic duo, on both offense and defense, Everett, who carried 81 times for 840 yards and 11 TDs. Wright, 272 yards rushing, and Kaleb Betrand, 167 yards rushing, will also be leaving with diplomas as well as offensive stats, creating a big void for LaRosa in 2019. On the defensive side of the ball, leading-tackling seniors ending their high school career include Levi Marshall III, Oliver, Everett and Isidro.